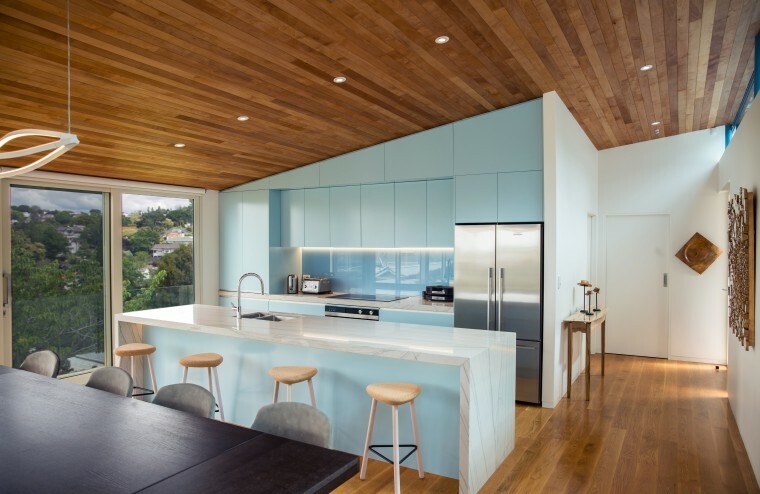 ​​​​​​​Finished in powder blue and defined by the warm tones of a Southland silver beech wood ceiling and an American oak floor, this kitchen by whole-house architects Kamermans Architects exudes a serene, tranquil air. 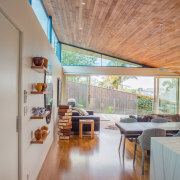 Positioning the living spaces at the upper level in this new home allowed architect Frans Kamermans to introduce higher ceilings and a twisted plane roof to optimise solar penetration where it was needed most. 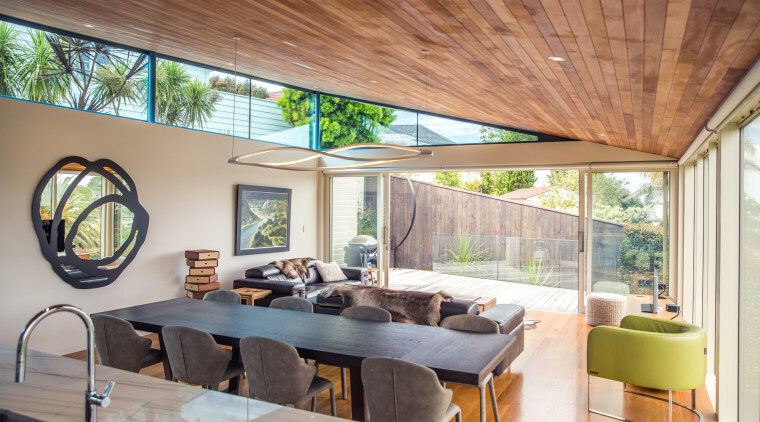 “This is the second house I’ve designed for the owners and as such I had quite a free rein, including with the design of the kitchen,” says Kamermans. 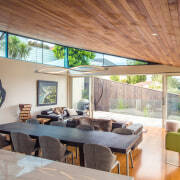 “The crisp, clean-lined kitchen has a sloping cabinetry profile matching the line of the raked beech wood ceiling. ​​​​​​​The largest surface area in your home, the floors can have a big impact. 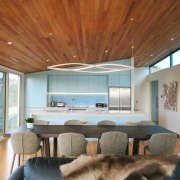 On this kitchen and house design by Kamermans Architects, the beech ceiling is complemented by the wood flooring in American oak. Granite kitchen countertops continue the emphasis on natural materials. The colour palette is dramatic yet simple. The warmth of beech, a favourite wood of one owner, on the floors and ceiling, meets powder blue, the favourite colour of the other owner. These hues appear throughout the home, with the front door also in the same blue. White veined granite benchtops complete the picture. Kamermans is from the Netherlands and says that, unlike with most New Zealand homes, kitchen space in the Netherlands can be limited. “However a modest kitchen area also allows for a work area triangle between pantry, hobs, fridge and sink which makes life easy for the chef, who barely has to take a step to reach the fridge one way or the pantry the other. And with the compact footprint comes a minimalist aesthetic. 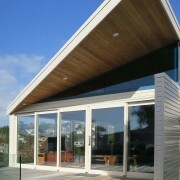 The pantry is integrated in one corner, the hood is also integrated and the hob is flush in the rear benchtop. Plus cabinet handles are either discreet or push or pull to open. Features of the kitchen include the waterfall island countertop, the reflective glass splashback and the under-cabinet and under-bench strip lighting which shows off the cabinetry surfaces and doubles as a night light for the wider space.